Riding a Vespa is one of the coolest things that you can do. Audrey Hepburn drove one in Roman Holiday, Charlton Heston rode one around on the set of Ben Hur, Jennifer Lopez straddled one during a photoshoot, and a number of celebrities have their own personal Vespas, from George Clooney to Paris Hilton. Despite how cool celebrities made riding a Vespa look, for many years I would not allow myself to operate any two-wheeled power vehicle. After falling off of a miniature motorcycle when I was in high school, I was very afraid that if I were to drive a similar vehicle again, I would crash and burn. When I visited Taiwan in 2011, I refused to rent a scooter even after I obtained an international driving license. In the Philippines and Korea, I had no problem sitting on the back of a scooter or motorcycle, as long as I was not driving it. The dashing Italian fellow that I dreamed of did not appear, but the opportunity to ride a Vespa did. I decided once and for all that I was going to let go of my fears and grab life by the handles. 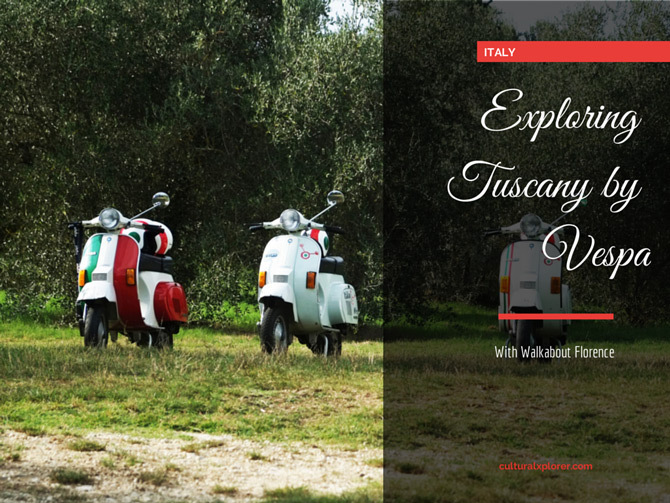 I contacted WalkAbout Florence after hearing wonderful reviews about their Vespa tour around Tuscany. I also thought it would be a good idea for me to be with a professional rider and a group of people if I was going to to attempt to overcome one of my greatest fears. On the day of the tour, I met the group I would be riding with in front of the Walkabout Florence office, which was located on a little alleyway. Upon arrival, I was fit with a helmet and given a brief driving lesson that taught me how to operate a Vespa. It took me a little while to get a hang of riding the vehicle, and after about ten minutes, we took off. The tour started in the streets of Florence, which admittedly was a little frightening for me as my brain was working on making sure I stayed in control the vespa and my body was working on trying to avoid getting hit by a car. We then traveled across the beautiful Arno river and up to the San Miniato al Monte church, where we had a stunning view overlooking Florence. After walking though the church and learning that the cemetery held the body of the author of Pinocchio, we left and began our journey into the nearby Tuscan countryside. We weaved through tiny little roads surrounded by vineyards and rolling hills. Little homes with auburn roofs and green shutters dotted the countryside. We stopped briefly near an old abandoned home to learn about the food and wine production of the Tuscan region and why the area is important to Florence. After snapping a few photos, we hopped back on our vespas and continued riding through the countryside. We stopped briefly to turn a corner, and when I gave my vespa gas to start it back up, the unthinkable happened. My guide immediately rushed over to assist me and luckily it started back up. We headed back through the city to get to another area of Tuscany, and as we turned onto a busy road, I had to slow my vespa down to move along with the traffic and then I had to stop it as the traffic came to a halt. When I went to power my vespa back up, it happened again. I flooded the engine (again!) and got stuck right in the middle of traffic on a busy road. Mortified, I tried flagging my guide down as I attempted to lug the vespa off to the side of the road while passerby’s gave me pitiful stares. The guide rushed over and seemed shocked that I could manage to flood an engine so many times within a short time period. He graciously picked up my vespa, dragged it across the two lanes of traffic, and tried to restart it. It gave a little cough and moan as it tried to restart, and for a short period, it turned on and was able to make it up the hill, where it then decided to end its life. The guide found a little shop to leave it next to, and I hopped in his car with him for the remainder of the ride. We made our way through the countryside again and stopped at a vineyard, where we learned about the production of red and white grapes in the area. As I tour came to a conclusion, my group stopped in the Oltrarno neighborhood to have some antipasti (pre-meal food) and wine. We chatted about our lives and laughed about the number of times I flooded the engine. Although there was some unexpected situations that arose during the tour ( such as my flooded engine), I learned an important lesson during the experience: When traveling, the unexpected can happen at any moment. If you keep a positive outlook on any situation that may be thrown your way and make the most of it, you will make it out alright. I still believe that riding a vespa is one of the coolest things you can ever do, despite my lack of skills at operating the vehicle, and I would gladly go through the entire experience again! Thank you to WalkAbout Florence for providing me with a discount on my Vespa tour and as always on this site, all opinions are my own. Oh the food-yum! Good for you that you gave it a try! I have done a few things on my bucket list like parasailing that I was terrier during but glad I did. I have never been on a Vespa but also enjoyed touring thru Tuscany! We went to a small medieval town-San Gimignano! Congrats on doing something outside of your comfort zone – and enjoying it! What a shame your Vespa couldn’t complete the tour – just as you were starting to enjoy yourself. I know right? At least I was able to enjoy riding it for a little while, it was a lot of fun! I want to try cruising the Italian countryside on a Vespa. But the anti-adventurist in me as always, gives me second thoughts. I hope I can find that courage when I visit Italy again and have that great Vespa riding experience. Wind on your face with the beautiful sun above you while traversing the hills with the beautiful view of the vineyards…I can imagine what beautiful feelings it can bring. It was such an incredible experience and I sincerely hope that you will give it a shot – it is a memory that I will never forget! Love this! Made me laugh. I would love to do it but fear my experience would be very similar to yours. I’ve been wanting to learn to ride a motorcycle for the longest while. I’d settle for learning to ride a scooter or VESPA anyday, really. I feel like people who ride anything with two wheels and a motor are living the life.